Your Shoulder blades play a crucial role in the movement of your shoulder. If the muscles that support the shoulder blades are too weak or too tight, then normal movement of the shoulder joint cannot occur and over time, this leads to shoulder pain. The muscles that stabilise the shoulder blades onto the rib cage are the rhomboids, traps, seratus anterior and levator scapula. 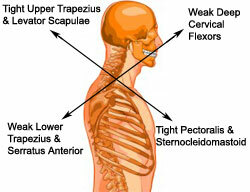 These are the exact same muscles that are affected by sitting with poor posture. Your physiotherapist can measure the angles around movements around your shoulder blades to determine if they could be the cause of shoulder pain. Here are 3 exercises that can be hepful in rehabilitating shoulder blade weakness. Lie prone with a towel or pillow under the forehead. Extend arms out the the sid. Slowly raise arms up and down. Reapeat 3 sets of 10 in positions A-E above.